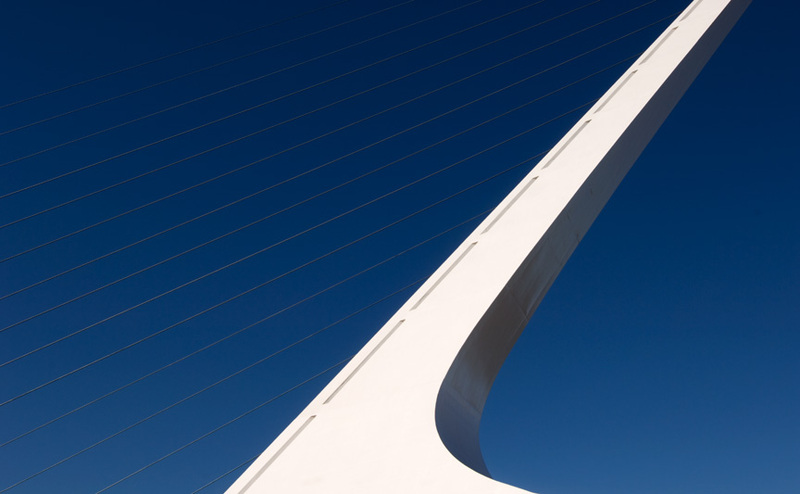 Calatrava's Sundial Bridge, a rushed stop for me on a pilgrimage of sorts (I've pored over his bridges in print many times over the last few months). This is a bridge about lightplays and drawn tension, and (like the Golden Gate Bridge), it's an example of unabashed technology that should look strident in such a natural context, but that works because it's so strikingly unlike anything around it, because it's so strange and alien (in some ways it struck me that it looks like it's been there forever). That bridge is amazing. Having seen a PBS special about the bridge I stopped off to see it during a drive to Portland. It's amazing that the city seemed really torn by the money being spent to build the bridge. I would never have stopped in their town had it not been for the bridge. I filled up my gas tank, had lunch, looked at the bridge, bought some coffee and contributed a total of about $50 to their economy. I'm sure on a good day they have 5k to 10k people who do the same thing because of that bridge. It was worth the stop, a beautiful piece of architecture that Redding should be proud of. Yeah, it's beautiful, more striking in real life than I'd expected. It's definitely depressing just how much effort went into trying to kill it off or to decry the money spent on it in the early days  realistically, it's one of the few things that Redding has going for it (beyond the eternal sunshine and the city's dramatically-brooding setting). Like you, the only reason I've ever stopped in Redding in a couple of decades of driving through it is the bridge  and it's heartening to see that locals seem to like it a lot now, too. When you start seeing names like "Sundial Grill" in the surrounding area, you know it's become a landmark.